Full Color — Clear BOPP, White BOPP, White textured Estate #8, White vinyl (Indoor/Outdoor). Get creative with roll labels. Choose from circle, oval, square, rectangle and starburst shape options. Make an impression that will stick with your customers. The adhesive is a type of glue on the back of the label, which with slight pressure applied, makes the label stick to the substrate (the surface to which the label is applied). Available adhesive types are removable, permanent, repositionable, etc., in acrylic or solvent (rubber based.) Currently, Save 4 Printing is offering a General Purpose permanent acrylic adhesive. A label with this adhesive cannot be removed without the label being destroyed or leaving residue on the object that it was applied to. This adhesive generally adheres well to most corrugated, paper and plastic substrates but is not guaranteed to work for every application. Labels with this general purpose permanent adhesive can be applied at temperatures as low as 25 degrees – 35 degrees F. It has a service temperature range of -50 degrees to + 150 degrees F.
Save 4 Printing does not sell “pre-cut” roll labels. Every size offered is custom produced and die-cut after printing. The die cut is accomplished by using a die which is basically made up of cutting blades that are formed into the desired shape. The die will cut through the facestock only and not through the liner. Save 4 Printing’s labels are die cut with a gap between labels. It is the distance from the bottom edge of one label to the top edge of the next label. 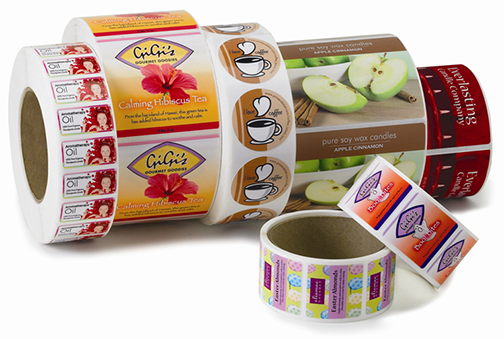 The desired outside diameter for rolls of labels printed for Save 4 Printing customers is 5.5″. This is a common size that fits most hand-applied dispensers. The quantity per roll varies per label. The size and shape of each label determines the amount of labels that will fit onto a roll. If you have chosen a thicker material and heavier laminate, the quantity per roll will decrease. If your label is small or on thin premium paper stock, the quantity per roll could increase. All Save 4 Printing rolls of labels will arrive wound onto 3″ cores. This is an industry standard and should work for most applications. Typically, the core size only matters when a label is being applied by an automated labeling dispenser. The dispenser’s construction may not allow for a 3″ core. It is suggested you verify a 3″ core will work with your application prior to ordering. Wind positions are an industry term that indicates how the rolls of labels are produced – so that the labels are facing in the right direction on the roll at the time of application. It is usually only important to specify a wind position when the labels are going to be machine-applied to an end product. This ensures that the applicator is receiving and dispensing the labels in the correct orientation for the container. If the customer is intending to hand-apply each label, wind position usually isn’t important.